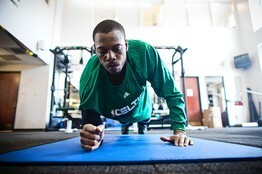 Paul Pierce knows determination. He didn’t start playing basketball until he was 12 years old. While he was cut from his high school varsity basketball team his freshman year, he later became the star of the team his junior and senior years. He went on to play for the University of Kansas, entering the NBA draft after his junior year and was the 10th overall pick by the Boston Celtics in 1998. 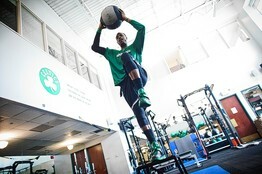 He sticks to a strict training regimen even amid the Eastern Conference Semifinals against the Miami Heat. Mr. Pierce is sometimes known for a fiery temperament on the basketball court. “I play with a lot of emotion,” he says. “It’s up and down depending on how I’m playing, how the team is playing, the calls that are being made.” Off the court, Mr. Pierce tends to be more laid back and devotes a portion of his time to charities. Re-published from a SLAMOnline.com article published on October 5th, 2010 – HERE. To read the entire SLAMOnline.com article, click here. 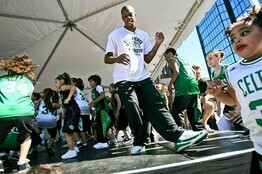 Paul “The Truth” Pierce can help motivate your kids to eat healthy and be more active. All you have to do is join FitClub34! The Celtics Captain launched FitClub34, a FREE rewards-based fan club turned “fit” club that provides the information, resources and tools necessary to become more active and physically fit. The program features monthly challenges, age-appropriate exercise routines, healthy recipes, and rewards-based incentives. BOSTON and NEW YORK (February 11, 2010) – Eight-time NBA All-Star Paul Pierce joined the nationwide fight to combat childhood obesity today as a National Athlete Spokesperson for the Alliance for a Healthier Generation, a partnership of the American Heart Association and the William J. Clinton Foundation. You are currently browsing the archives for the online press category.